To my knowledge, no bombs fell on Brisbane during World War II, but its citizens were certainly prepared for the possibility that they might. Part of their planning was the construction of air raid shelters to protect Brisbane's inhabitants from a Japanese bomb attack, should it occur. 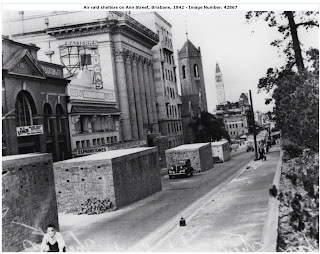 The bombing of both Pearl Harbor and Singapore had shown that aircraft carriers could transport enemy planes to within striking distance of Allied positions anywhere in the world; so air raid shelters were built in various locations around Brisbane, including some in Ann St, shown with and without the shelters in the pictures below. These shelters, built for city workers, were quite large, as can be seen by comparing them with the car in the centre of the image. For those who want to know more about the shelters, I commend this web page, from Brisbane's Living Heritage Network, which sets out a walking tour of WWII Brisbane, and includes description of the construction of the shelters. Further examination of our WWII photo, though, shows several Ann St buildings, including the RS Exton building, the Elphinstones building, the Masonic Temple, Shell House and St Andrew's Presbyterian Church, which is on the corner of Creek St. Further in the background can be seen the City Hall clock tower. 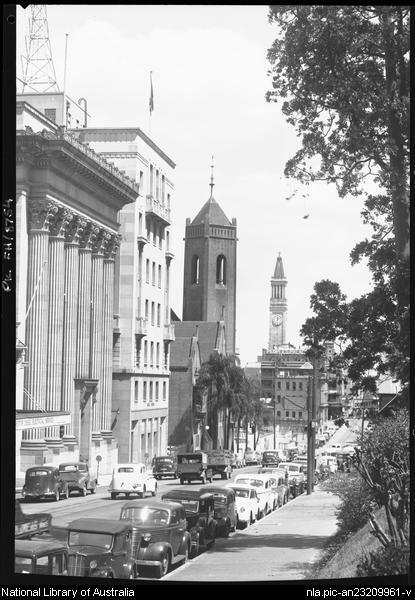 We can see from today's picture that, fortunately for Brisbane's commuters, the air raid shelters have been demolished , but that several of the buildings remain. Take a look below. (Photo: © 2009 the foto fanatic)Still visible, from the left hand side of the photo, are the RS Exton building (partially obscured), the Masonic Temple, Rothbury Hotel (formerly Shell House), and the church. The Elphinstones building, which was next to RS Exton & Co, has been replaced by a newer construction, simply called 333 Ann St. The City Hall tower has now been blocked from our view by the Commonwealth Government office block on the far corner of Creek St.
As I'm a baby boomer, I wasn't around during World War II. But looking at this old photo makes me wonder about my parents and grandparents who lived in Brisbane during that dark time. Their lives must have been so different from ours today, and we owe it to them to ensure that these events do not recur.